As my Craftsman 10’’ has recently become a bit dangerous to use I started inquiring about some other models. I became interested in the DEWALT DW745 10-Inch Compact Job-Site Table Saw with 20-Inch Max Rip Capacity - 120V mainly because I have previously owned power tools from Dewalt and I consider it a good source of high-quality merchandise. That being said, I realize that a portable unit, albeit a powerful, high-performance one will not work in the same way as much larger models. However, portable and efficient is what I need right now. What Should You Look For In A Table Saw? As I am mainly working with small pieces of furniture not large onsite panels, I find the DEWALT DW745 10-Inch Compact Job-Site Table Saw with 20-Inch Max Rip Capacity - 120V a good choice for my needs. The fact that it comes from a manufacturer I have previously bought from is an added bonus. Considering the motor’s power, fairly large for a compact unit, and the precision of the blade I do wish I wouldn’t have waited for so long before acquiring it. The DEWALT DW745 10-Inch Compact Job-Site Table Saw with 20-Inch Max Rip Capacity - 120V seems like a good choice for people more interested in portability. Keep in mind that though quite a powerful and efficient unit, this saw will not act the same way as a larger models. Though definitely not intended for cutting very large pieces of dense wood, I find it a pretty good option for smaller dealings, mainly along the lines of cutting wood laminate flooring. Smaller contractors will find it helpful as it does an admirable job power wise and it can easily be carried with just one hand. However, if you are keen on having a dado stack, this might not be the saw for you. Any good woodworker knows that it is important to invest in some high-quality equipment. Depending on your area of expertise, a table saw might just be the most expensive item you will have to purchase. As this tool will have a lot to endure, making an ill-advised choice will only end up in a decrease in productivity, not to mention your finances. Most contractors use saws with 110 volts in power, as they are more available. That being said, switching to a 220 volts unit will have a much-needed benefit – the saw’s motor will be less likely to decelerate when put through a heavy workload. This is a great perk for a workshop. However, if you opt for a portable, compact unit, you will be unpleasantly surprised to find out that not all locations provide 220 volts in electricity. Any table saw’s fence simply has to be accurate. It has to stay in a parallel position to the blade at all times during the working process. Look for a fence that doesn’t flexes as this will only make the saw blade bind with the wood, leading to potentially dangerous kickbacks. The same things goes for sturdier fences that are hard to adjust. When you choose a table saw take some extra time to inspect the fences. A good fence should be easily removed/ attached, locks pretty tight in place and stays true to the blade every single moment. Yes, most saws – especially the compact, portable varieties – do not come with a dust collector per se. However, keep in mind that a good model should allow you to connect it with some sort of vacuum system you might have laying around. While the more traditional table saw varieties use a right-tilt mechanism, newer models will use a left-tilt one. Choosing a saw with this aspect in mind relates strictly to personal preference. This feature should be very sturdy, with easily adjustable angles. The miter gauge should slide in the miter slots without any problems or sloppiness of the mechanism. As table saws can be quite dangerous to work with, even if you are quite careful, most modern units nowadays come equipped with some safety features. · A good riving knife will keep the boards separated, not letting the wood nip at the blade. This will prevent any unwanted kickback. · A large, paddle switch will enable you to turn off the table saw with either your foot or knee. · Blade guards come in the form of either a single or dual piece of plastic that helps cover the top of the saw blade. · Anti-kickback pawls usually come on other side of the riveting knife, rising up when the wood piece passes past the blade. These pieces of metal with teeth will act quickly, grabbing the wood if it tends to kick back. The Dewalt DW745 is a compact, light jobsite saw, the most portable one in its class. Its sturdy steel roll cage is able to handle any jobsite hardship, and the 1850 watt high-performance motor make this saw ideal for cutting even the toughest wood varieties. The large, clear scales, and front and rear fence lock combine with the rack and pinion fence system to give more accuracy to any cut. The fence system of this Dewalt model will provide about 610 mm of rip capacity, especially ideal when trying to get larger materials to size. As a plus, the saw’s overload protection system will ensure every performance is accurate, no matter the environment you are working in. Fully adjustable, thanks to the quick bevel lock complete with a large scale, this portable unit comes equipped with a few needed accessories, namely, a parallel fence, a miter fence, a push stick, a dust port reducer, 2 blade spanners and a series 30, 24-tooth saw blade. This saw comes with a 15 amps motor, quite a powerful one considering the actual size and compactness of the unit. The incorporated 10-inch blade will spin at a no-load speed of about 3,850 rotations/ minute, regardless of the material to be cut, be it pressure-treated lumber or hardwood. The unit’s overall rip capacity, about 20 inches, is easily enabled by the fence configuration. The fences are also quite easy to adjust thanks to the rack and pinion fence rails. The overall design will allow these rails to expand to 20 inches to better enable the saw to rip full sheets of material, as well as retract for a more compact, easy to carry format. This Dewalt model has a maximum cut depth of 3-1/8 inches when at 90 degrees, and a 2-1/4 inches when at 45 degrees. The modular (easily removed and attached) guarding system of the Dewalt DW745 is quite easy to set up, allowing a tool-free adjustment. The saw’s table surface is actually coated, thus reducing any potential friction. This leads to an improved cut quality across the board. For an increase in durability, the saw’s roll cage is metal, a sturdier setup if you are comparing it to plastic ones. The overall design of the Dewalt DW745 combined with its light weight, around 22 kg, make it an easy to carry unit. As a plus, the on-board storage area will provide an easy reach to several components, push stick and guarding accessories. For a cleaner workshop/ working area the saw can be easily connected to a Shop-Vac thanks to its efficient 2-1/2 inch dust collection port. Though I really needed a new saw, preferably a very compact one, I decided that a bit of advanced research would only help me. Yes…I actually took the time to read most reviews I could get my hands on. To no surprise, I discovered that all items on my shortlist had hundreds of reviews posted online. was intrigued at the sheer number of people that took a few minutes out of their schedule just to review this saw. So…is it good…is it bad? Starting with the good comments, most people had actually gave it a high rating. Some really liked the rack and pinion system, praising its cleverness as well as the saw’s accurate cutting performance. Others who have used this brand in the past were quite pleased with the new model’s improvements saying that the connecting rod is not flimsy anymore. Apparently Dewalt reads reviews which is an awesome thing in my eyes. Though the saw has a fairly small cutting surface, it is a portable model after all, a few users employed it to cut into fairly thick, large cedar pieces and the saw kept up pretty well. The dust collection port was also seen as a great feature, mainly by people who work inside, in small workshops. On a more negative tone, some buyers had an issue with the fact that the rip fence only extends 20’’. And although most people were quite pleased with this unit, the fact that it has no dado capability came into discussion. Though I really like the DEWALT DW745 10-Inch Compact Job-Site Table Saw with 20-Inch Max Rip Capacity, I am all for having a few options. Another great choice in terms of portability is this little fellow from Bosch. Made from high-quality materials (all-steel), this saw is well-known for its durability. Like the Dewalt, this saw also comes equipped with a powerful, 15 amp motor, being able to cut even through very dense hardwood. Though a bit heavier than the Dewalt DW745, this unit is also easy to carry and depending on your physique, you could transport it with just one hand. Possibly the best perk about this Ridgid saw is the fact that it allows room for a dado plate. I find this a plus, especially since most contractors miss dado stacks after going from a larger saw to a portable, compact one. The overall high-quality starting with the blade and finishing with the incorporated fence makes this Ridgid unit a pretty good option for many. Previous users attest that it’s able to handle most things you though its way. Equipped with an aluminum tabletop and some high-quality HR extensions for an increased workspace, this portable saw from Delta Power is also a good option when it comes to eliminating all fuss. Though quite a bit heavier than its counterparts (close to 88 pounds) it’s still fairly easy to carry with you to any jobsite. The 10-inch Delta saw blade is high-quality and performs well, at least according to previous users. What I find particularly attractive about the 36-6020 model is the fact that the blades are retractable. Having them move to the space below the table will do wonders for the final clean-up process. Like many of the better models on the market, Dewalt and Bosch, this Hitachi unit will also provide you with an on-site much-needed storage space. The 15 amp motor is quite powerful, being able to produce 4,500 rotations/ minute. What I like most about the Hitachi C10RRJ is the fact that, unlike other models, it has a dado capacity (13/16’’). Another unique feature is the telescopic table extension that supports up to 35’’ ripping capacity to the right and 22’’ to the left. Everyone has their own reason for wanting to invest in a good table saw. Whether you are a professional contractor or just the occasional DIY aficionado, one thing is sure – you want to purchase a high-quality saw that will pay its own value in the long run. 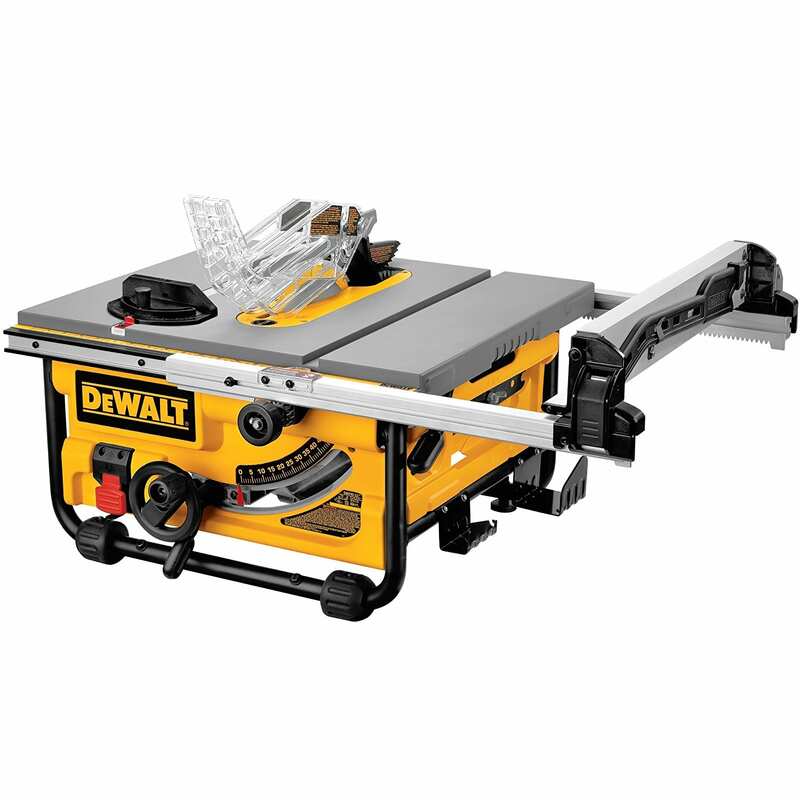 While some contractors with larger projects will probably want to get a heavier type of saw, I find that the DEWALT DW745 10-Inch Compact Job-Site Table Saw with 20-Inch Max Rip Capacity - 120V works just fine for me. I do like this portable unit quite a lot, mainly as I really wanted a more compact, easy to use saw. Though not as great at cutting through large, dense pieces of wood, it does its job admirably for my small furniture endeavors.